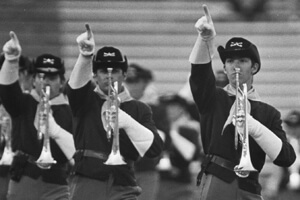 Blue Devils swept all captions at the 1986 Drum Corps International World Championship Finals in Madison, Wis., making them only the second corps in DCI history to have done that—the first being BD's World Championship corps from 10 years earlier. This was also the corps' third title win with "Channel One Suite," which was also played for the first time in 1976. Santa Clara Vanguard brought us a Russian costumed spectacular, with a surprise change of pants during the opener. The Cavaliers topped Garfield Cadets by 0.10, introducing Steve Brubaker's "Dragon" drill maneuver and earning the corps its highest finish to that time. Cadets, with only 12 color guard members, utilized white plastic clarinets as props and got national exposure prior to the season by performing for the rededication of the renovated Statue of Liberty. Kenton's "Adventures in Time" presented Suncoast Sound with its highest placement ever and Spirit of Atlanta took us into a southern revival meeting. Madison Scouts presented its take on "Alexander's Ragtime Band" and Star of Indiana loaded up on a record number of contras for "The Conversation" from "Close Encounters of the Third Kind," with the color guard wearing long white fright wigs. A bicycle-riding Wicked Witch of the West and a balloon that lifted Dorothy back to Kansas helped lead Sky Ryders to finish above 10th place Phantom Regiment, and Velvet Knights finished 12th with a wacky take on James Bond. This was also the last time we would see Troopers in Finals until 23 years later at DCI's first World Championship inside Lucas Oil Stadium in Indianapolis. The 11th place corps presented a patriotic show that was very much in the style of shows we had come to expect from "America's Corps." The show started with the drums and horns in company front formation, backing up from the front sideline. Usually, such fronts proceed toward the audience, but this allowed the opening martial fanfare from Morton Gould's "American Salute" to hit with maximum force. The horn front was timed so horns would pop up on the restatement of the theme just as the line hit the front set of hash marks. The piece is Gould's take on the Civil War melody, "When Johnny Comes Marching Home." Discount DVD offer ends Monday, Oct. 8 at 8:30 a.m. ET.